if enabled, the EA will move the SL to the nearest Pivot level, just behind the current price. This feature allows to make sure that one trade is at least a safe profit. You can then decide if open an additional trade or wait the price to reach the next level. How to Use the EA? It is very useful during a sideways phase for scalpers or for swing traders. My suggestion is to enable the first level S1/R1 for short-term trades or R3/S3 for medium-term trades. 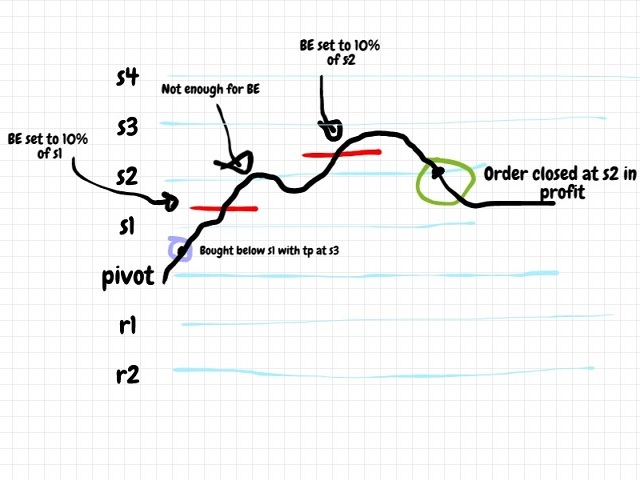 Alternatively, you can look for price bouncing between S1/Pivot or R1/Pivot (especially on overnight session). Usage of pivot lines is very reliable because represents a point at which a major price movement is expected to occur. The EA works even as indicator: the pivot levels on the chart will be refreshed and painted with different colors on a daily basis. Will not open orders automatically - there is no internal logic and conditions to open orders. So this EA is intended to work as a semi-automated system. Will not show previous days pivots - the EA will show only the current day Pivot, Support and Resistance based on the day before data. Will not works with more than one feature simultaneously: you can use Pivot Stops, Breakeven or Fixed stops just one by one. They will not run if enabled at the same time. Use Breakeven? : enable the breakeven function. Breakeven Percentage: select from 10 to 50 percent. This value is take between the two pivot levels of the current prince. Ie. if the price is currently above S1 and below S2, the SL of the current Long trade will be moved to S1 only if will be above (S2-S1)*10/100. It is actually a "sensitivity" value to set the breakeven. Use Pivot Stops? : enable or disable the function. This function will move stop loss and take profit of any opened trade (with matching Magic Number) onto the pivot lines, including support and resistance. This function will not work if Use Fixed Stops? is already enabled. Pivot SL level: from 0 to 4. Zero if you want to place the stop loss right onto the Pivot line (blue) or 1 to 4 if you want to place the stop loss on R1, R2, R3, R4 if short, or S1, S2, S3, S4 if long. Pivot TP level: from 0 to 4. Zero if you want to place the take profit right onto the Pivot line (blue) or 1 to 4 if you want to place the take profit on R1, R2, R3, R4 if long, or S1, S2, S3, S4 if short. Use Fixed Stops? : enable or disable the function. This function will move the SL and TP of any opened trade (with matching Magic Number) on a fixed pips value. This function will not work if Use Pivot Stops?is already enabled. Fixed SL values: pips for stop loss. This value will be used even if Use Fixed Stops? is disabled, as an alternative stop loss in case of a wrong pivot line, i.e. if you have a short deal opened, and the Pivot SL level is below (instead of above) the current price, the stop loss will be set to this value. 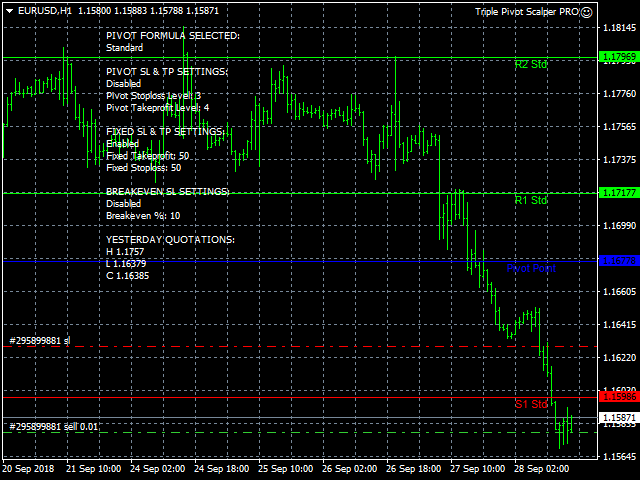 Fixed TP values: pips for take profit. This value will be used even if Use Fixed Stops? is disabled, as an alternative take profit in case of a wrong pivot line, i.e. if you have a short deal opened, and the Pivot TP level is above (instead of below) the current price, the take profit will be set to this value. Pivot Formula: 1 for Fibonacci, 2 for Standard and 3 for Camarilla. Magic Number: set zero for manual trading or set your EA magic number. If error "array out of range" is shown in the journal, this means that the Daily chart data is missing. Please refresh the view by switching between M1 to D1, then close the chart, open a new chart and attach the EA again. Pivot Formula - How Is It Calculated? Fixed issue with display info. Now is removed once it is disabled.